Artichoke is one of these things most people don't know what to do with. You don't know how to start, what is edible and what is not, preparing is awkward and when it is all cleaned and prepared what to do next? This last one is easy, boil it and serve it with butter or mayo or any other sauce like to dip the leaves in. Is that it? There must be another way of eating this thing. To start, if you don't want the hassle buy it in a jar. Chose a good quality one and pay a bit more. The vegetable take ages to prepare and get flown hundreds of miles. This costs money, so Tesco Valeu 99p tin is definitely rubbish. Don't go there. 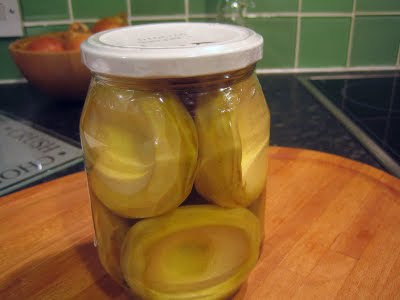 I buy mine in a jar not because I can't be asked, but because I prefer the Syrian artichoke to the European variety. Although the same plant, ours is less sour, more flavoursome and more earthy. I am not sure why, may be because of the soil or temperature or whatever... I am no farmer so I don't have a clue.In Syria we only eat the hearts and we throw everything else away, leaves, stem.. the lot. All to the bin! You can buy Syrian artichoke in London in Damas Gate supermarket in Shepherd's Bush. Salad is my favourite way of eating artichoke. It really showcase the unique flavour of artichoke. 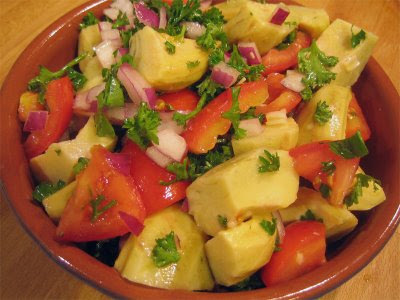 You can eat it as starter, mezze dish or slap a piece of meat of any kind and you got yourself a main dish. I imagine veal scallop with a squeeze of lemon will work very well with this salad. Make a dressing with olive oil, lemon juice and crushed garlic. Wash the artichoke to get rid of the salt. Cut into bite size pieces. finely chop the red onion and chop the tomato. Add the parsley and and the dressing and mix well. Oh, happiness! I love artichokes, and these look outstanding! I havn't seen you on my blog for some time. welcome back. Nice recipe. I find artichoke very tasty. It is good for health. It is rich in iodine. It reduces cholesterol and improves blood circulation, it is also helpful for diabetic people and is great for liver. It is also good for hair and is excellent treatment for eczema. It has many more uses and benefits. Welcome to my blog. It looks there is nothing artichoke can't treat !!! we can make omlete . or cooked with meat and pine nuts or cooked with onions and lemon juice. here in canada too we get the egyptian frozen type. Welcome to my blog. I hope you like it. Please try as many recipes and let me know how they go. heard about artichoke dip .Artichoke salad is new to me.Syrian artichoke is better in taste .Wow hmm a good finding .